Yes, I like pina coladas and getting caught in the rain. what I really like is are margaritas and tons of hydrangeas (and having an umbrella and wellies when the downpour starts). I also love peonies so be sure to read my tips on planting peonies. In August, my hydrangeas start to fade so I have to quickly take action so I can enjoy them all year long. I take way too many pictures of hydrangeas – and other random things like thrift shop finds and estate sale houses on Instagram – follow along! Love peonies as much as hydrangeas? Check out my tips for planting peonies so they bloom! They are all over my living rom table right now–love them! So beautiful Kelly! Thanks for the drying tips, I have been experimenting drying my own and found the water tip works very well!! Ahhh never knew the water tip. Thanks!! I love my dried hydrangeas! I forgot to dry some this year, so I need to get outside and see if it’s still possible. Thanks for the tips and reminder! just beautiful !!! 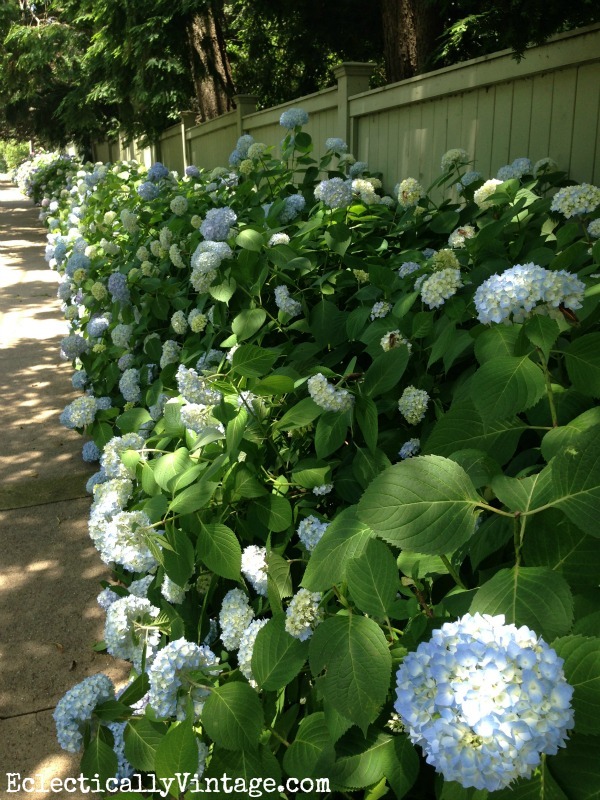 !…I have to buy dried hydrangeas on line…they do not grow where I live…Darn !!! How I wish I had some in my garden to dry! Thanks for this top Kelly, will keep it in mind for sure! Kelly great tips and I adore hydrangeas. I want to plant some at the new house. Love hydrangeas but cannot grow them here. Thanks for the tip in case I ever have a chance to get some fresh ones. Thanks for the tips Kelly, I was wondering how to keep my hydrangeas pretty in my living room. I can never get enough pictures of Hydrangeas. They are my most favorite flowers. Your hydrangeas are gorgeous Kelly!!! Your hydrangeas are so pretty! I dried mine the same way last year, they were deep purple and dried to be blue. I’ve also tried hanging them upside down from hooks inside of closets, and tehy dired nicely. This year they are turning brown on the bush , but I still got some. My daughter just moved to a new house with oaaak leaf hydrangeas, so I’ll see if I can dry some of them now. Kelly, I have never tried to dry hydrangeas but I was just looking at some of my blooms today and was thinking that I should. Thanks for your timely tips! I am so envious, your hydrangeas are breath taking. Just not fair, no it is, I live in wrong part of country is all. Too dry here (western CO) for them and we have so much alkali in our soil it kills everything. Even the Russian sage is pretty bedraggled this year, usually they’ll keep on blooming and growing in almost any conditions/soil. I love hydrangeas so much, they’re so darned pretty and delicate looking. Yours on that row of plants are drool worthy. I thought I was a hydrangea growing failure till Thursday. Then, while mowing lawn, I spotted among the weeds the plant I thought I killed. And it had three small balls of blooms. I love hydrangeas! My favorite nursery is selling a hydrangea tree. If it wasn’t $150, I would have bought it today. I already have three (maybe 4, two are close) different kinds – mop head, oak leaf and climbing. I’ll have to try drying them! ohmygosh! your hydrangeas! they’re gorgeous! that entire row is spectacular. Could you give us ideas as to what to do with the dried hydrangea?? Thanks so much! Nancy – you could make a wreath (just poke the stems into a styrofoam wreath form), spray paint them and put them in your Christmas tree or in a big vase or basket. I’ve just planted some hydrangeas this year so I’ll have to Pin this for next year – thank you!! 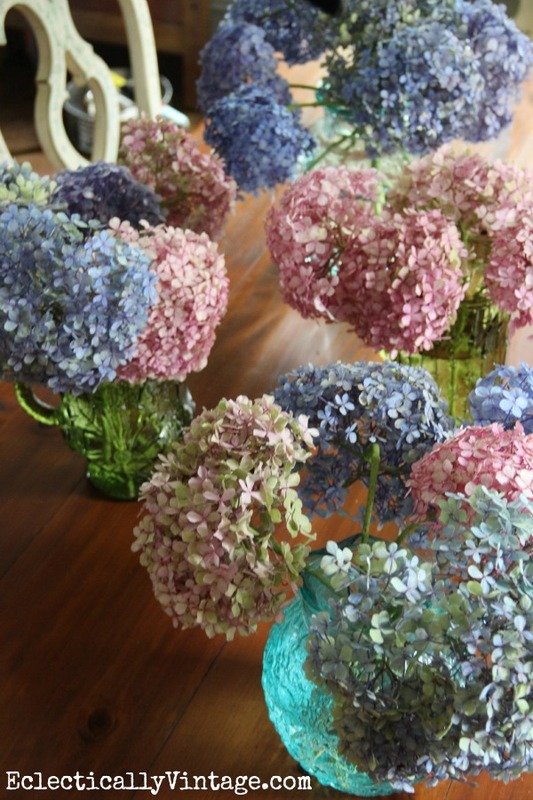 Love dried hydrangeas!! Yours are gorgeous! Beautiful hydrangeas! Love the owl in your picture too — where can I find one like it? It’s an Anthropologie cookie jar Dorene that I found at a rummage sale for $4 (price tag still attached)! Thanks for the tip. Love them! Thanks so much for this post! I’ve tried many times to dry hydrangea blooms. Most recently I had success but didn’t know quite why! Now I do, the water! Thank you thank you thank you!! Adding glycerine to the water when drying Hydrangeas leaves them very supple and not as papery and also preserves the color.Have been doing this successfully for years,also works on some other flowers. after drying the hydrangeas I also find spraying them with the cheapest hairspray you can find preserves them a little more,especially for arrangements. 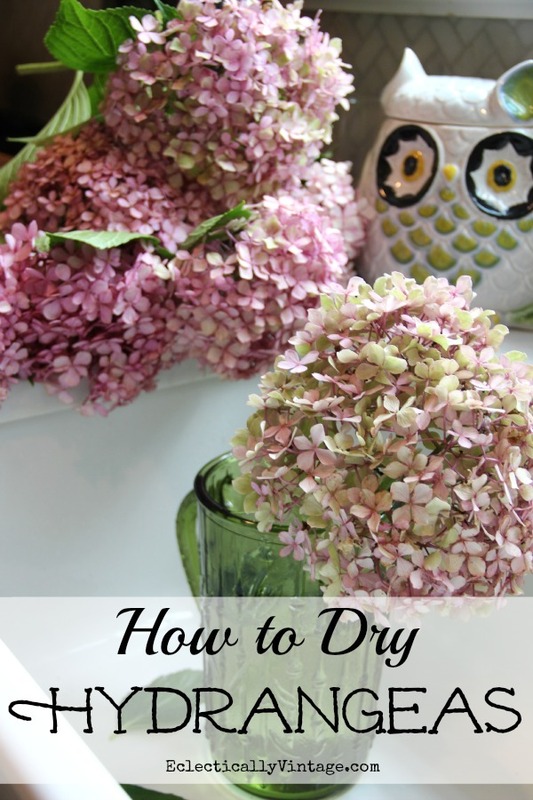 I’ve used hairspray on my hydrangeas too – thanks for adding that tip! I have always cut mine, strip the leaves and stick in a vase, basket, container… and let them dry. They stay beautiful until I am ready to do it again next year. I’ve never done it with water. Will give it a try. If your way works, stick with it! I’ll have to try your way! Your post was fantastic. The hydrangea along the fence was beautiful. I appreciated how easy it was to pin your post. well, i like all ur pics! its helpful. I just found out my parents let the gophers take over and they had over 30 plants that are basically dried out twig plants. I just can’t let it happen. Thanks for the tips! oh no! sorry about those gophers! My hydrangea plant is gorgeous….healthy…..very large…..but only a few blooms on the lower part of the plant. I fertilized it! It gets water regularly from a lawn sprinkling system. What can I do to get more flowers.